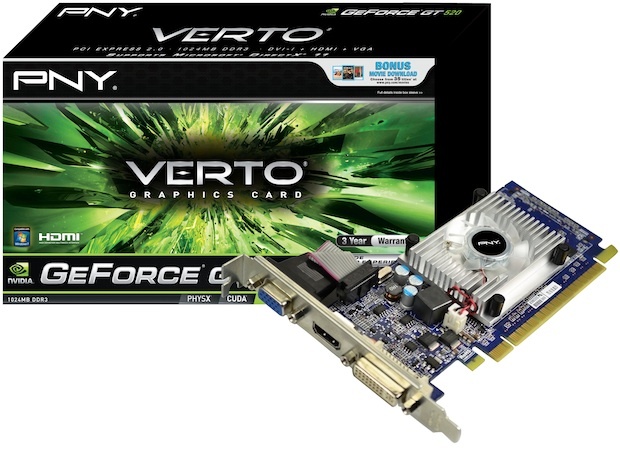 PNY Technologies announced the NVIDIA Verto GeForce GT 520 1024MB graphics card. The new PNY GT 520 graphics card is the perfect mainstream upgrade to bring the latest technology to computers at a reasonable cost. Whether you're watching or editing HD video, enhancing photos, or gaming with support for DirectX 11, this latest PNY graphics card provides a solution for every graphics need. The on-board HDMI port allows for easy connectivity to any HDMI enabled computer monitor or television.